Recent survey shows that 81% of healthcare providers have patient estimates on their website or plan to add them in the next 12 months. 68% of healthcare providers lack confidence in providing a total cost of care estimate in the next 12 months. 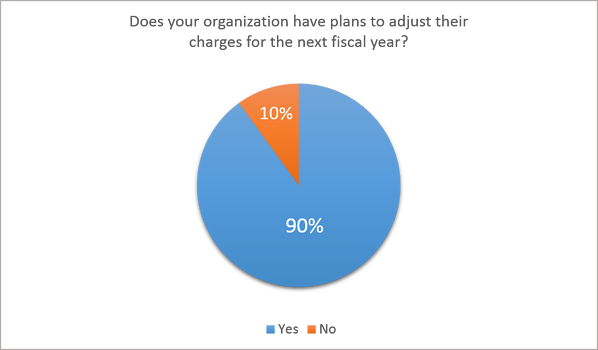 90% of healthcare providers plan to adjust their charges for their next fiscal year. 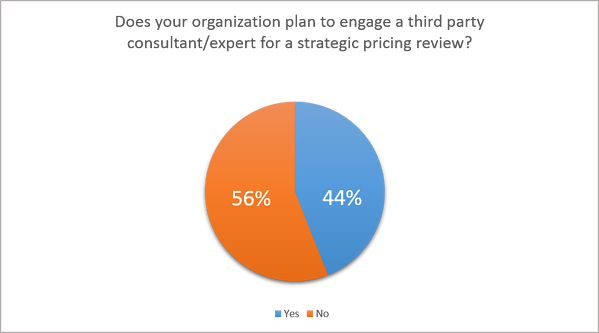 44% of healthcare providers plan to engage a third party consultant/expert for a strategic pricing review. With the January 1, 2019 CMS price transparency mandate now implemented, hospitals cannot afford to get complacent. Based on recent comments made by the Centers for Medicare and Medicaid Services (CMS), this appears to be just the first step in the price transparency initiative and hospitals should not be surprised to see more mandates following in 2019. Due to the recent shift towards consumerism, the industry is apparently responding with a strong sense of urgency from providers looking to improve their price transparency efforts. In fact, according to a recent webinar roundtable survey of more than 100 healthcare participants, the majority of surveyed providers (81%) claim to have estimates on their website or have plans to add them in the next 12 months. However, providers acknowledged the challenges tied to this with 68% responding they lack confidence in their ability to properly generate a total cost of care estimate that patients truly need. Without a total cost of care estimate, patients could be under the false impression that their cost estimate includes hospital plus physician charges, for example, when it may only cover hospital charges; it’s not fully transparent to the patient without knowing the total cost of care. Expedia.com is a website that customers use to plan vacations/trips by combining the price of hotel, car rental, air fare, etc., all into one bundled price. If the healthcare industry can manage to achieve a similar bundled price, then patients would have the education they need to be in control of their own financial responsibility. Charges alone don’t tell the patient what they will pay out-of-pocket, so it’s crucial that hospitals control the pricing message with an accurate total cost of care estimate on their website that patients can interact with in a clear, user-friendly format. The MetroHealth System in Cleveland, for example, embraces a culture of price transparency and created a separate “hospital charges” page on their website in addition to a link to their online estimator tool and online bill pay. “Our biggest concern is public misperception. We do not want patients to assume they cannot afford to have a necessary service performed based solely on the chargemaster price. We really want patients to understand that looking at charges alone will not give them the answer that they are looking for,” says Jackie Woolnough, Director of Revenue Integrity of MetroHealth System. 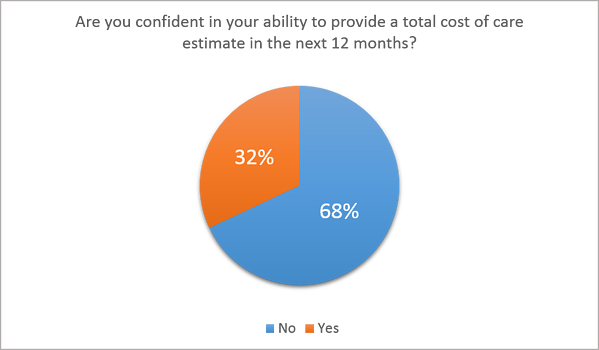 The second half of the survey asked healthcare providers about their plans for adjusting charges. Now that charges are fully public nationwide for the first time, now is the time for hospitals to review their chargemaster and develop a plan for making any necessary adjustments for the next fiscal year. Hospitals appear to be taking the publishing of charges seriously, as 90% of hospitals plan to adjust their charges for the next fiscal year. In addition, nearly half of hospitals (44%) plan to bring in a third party consultant to review their pricing strategy. When hospitals consider making adjustments to the chargemaster (whether it’s significant or minor changes), the key is taking enough time to plan ahead to drill down into services and determine if there’s any areas where costs can be lowered without sacrificing revenue. It’s recommended that hospitals focus on lowering charges on the items that are highly shopped for by consumers, such as commodity items. For organizations choosing to involve a third party consultant/expert into the adjustment process, it’s important to set clear revenue goals and decide how they would like to compete in the market. In general, the survey indicates a rapid market shift towards price transparency and consumerism. The healthcare organizations that succeed will be those that respond quickly and embrace this shift and use it as an opportunity to create a competitive advantage. As CMS Administrator Seema Verma clearly stated, hospitals should not wait for CMS to add further regulations to the price transparency mandate and fully expect providers to lead the change. To discuss a price transparency strategy for your hospital, schedule your 30 minute strategy session today!